Wildlife biologists in the U.S. state of Alaska are collecting genetic material from moose in an attempt to get a correct count of the big animals. The counting is being done in Alaska's largest city, Anchorage. 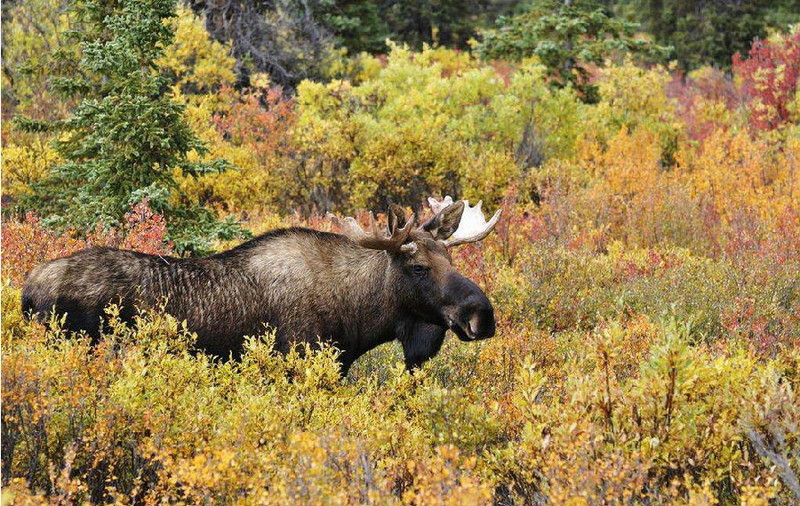 Many moose are found within the limits of the city of 300,000 people. But officials are not sure how many moose pass through the area. The counting process is not easy. The animals continually move and the city covers an area of over 5,000 square kilometers. In the past, officials used low-flying airplanes to watch for moose on the ground to estimate numbers. But rules from the city's airport now bar such flights. So Alaska's Department of Fish and Game is experimenting with a new method for counting the city's moose. They are collecting genetic material called DNA from the animals. They say this will permit them to get better estimates and identify each individual moose without having to capture them. Biologists sought help from the public during their three-day project last month. They asked people to call or send text messages to report when they saw a moose. Teams of moose trackers then quickly drove to the areas. The teams shot the moose with special darts designed to capture small pieces of skin and hair. The darts are weighted so they fall off the moose and can be collected. Researchers say the darts do not hurt the animals. The skin and fur are then taken to a laboratory to be studied. Biologist Dave Battle helped lead the project. He told the Associated Press that until now, officials had to take an "educated guess" about the number of moose in the city. "There's really been no technique up until now. And it's something we've been kind of beating our heads against the wall for the last couple of years about," he said. The project is paid for with taxes on firearms, ammunition, and archery equipment, as well as state hunting licenses. Battle says the technology is allowing officials to improve their knowledge and management of the moose population in the Anchorage area. But he added that it will take some time to study the DNA material to come up with specific numbers. Safety was a big concern during the project. Moose, which weigh up to 700 kilograms, can be aggressive and dangerous to people. Moose can cause deadly traffic accidents and also can harm people and other animals by stepping on them. My children have wounded me in the past. He developed embryonic stem cells that could produce mice that carried new genetic material. They have threatened military action but held off until now. 5.But he added that it will take some time to study the DNA material to come up with specific numbers. The president was moved to come up with these suggestions after the hearings. I don't think he can come up with any clever move. 6.Moose, which weigh up to 700 kilograms, can be aggressive and dangerous to people. A pineapple can weigh up to 10 kilograms. As the ice thickens during the winter, the blocks can weigh up to twice that.